A laser is a high-energy light beam that transfers energy into the skin tissue to effectively treat skin irregularities. A laser skin peeling can be used in the treatment of many different problems areas such as wrinkles and blemishes on the face. Laser surgery also erases birthmarks, skin lesions, spider veins and tattoos. Since the cosmetic surgeon uses the minimum intensity level, more than one treatment may be necessary. Laser cosmetic surgery is performed in an outpatient or hospital setting. Additionally, laser cosmetic surgery has been proven to help with hair transplantation. Lasers prepare the targeted areas where the transplant will take place. Eye cosmetic surgery, or a blepharoplasty, is a procedure that corrects the overall appearance of the eyes. This can be done by reshaping the upper eyelid by either repositioning or removing excess tissue of the surrounding muscles and tendons. Eye plastic surgery can be done to correct peripheral vision problems or fix bagginess and wrinkles surrounding the eyes. 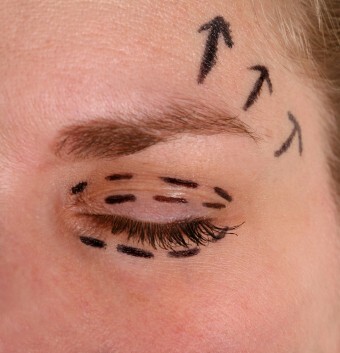 Incisions are made along the natural crease of the skin that protrudes over the eyelashes, and below the lashes of the lower lids. After the procedure, which takes about 1-3 hours, swelling and bruising will occur for up to two weeks. Final results will be seen within several months. In a non-surgical blepharoplasty, applications of a topical acid and/or the use of lasers are utilized to lower and strengthen the volume of skin in the lower and upper eyelids. Additionally, injectable dermal fillers are utilized to temporarily raise the volume in the trough area between the cheek and lower lid. Non-surgical skin care vs. surgery is always a difficult decision for the patient, but the patient may want to exhaust all non-surgical treatment options before opting to undergo a major surgical operation. The use of dermal fillers, botox, chemical peels and lasers have been proven to help improve the skin for early signs of aging. After these procedures some redness and swelling will occur for several days. Antibiotic ointments can be used for soothing purposes. Insurance does not cover these operations, so patients will need to check with their physicians about financing options available to them.